For best handling, the tires should remain perfectly flat on the road surface at all times. On a go-kart, this is accomplished by having all axles rigidly attached to the chassis. Impressive cornering performance can be obtained by a go-kart on flat pavement! However, a suspension system is needed to allow a car to be used on real roads. This creates compromises that keep the tires from always remaining flat on the road, and also leads to undesirable weight transfers that exaggerate the loading on the outside tires in a corner. This article provides an explanation of fundamental suspension principles and recommendations for achieving optimum suspension performance. A solid axle tends to keep the tires flat on the road because the axle doesn't lean with the body. However, with all but very low profile tires, the outer tire will compress during cornering, and allow some tilting of the axle. For independent suspensions, geometrical considerations are much more complex. This is because the suspension is attached to the body, and as the body leans there is some type of geometrical mechanism to keep the wheels (especially the outer wheel in a turn) from leaning as much as the body. There are also interactions between the front and rear suspensions in terms of roll center and roll stiffness. The roll center of a suspension design is the theoretical point that the body pivots around as it leans. This can be drastically different between front and rear suspensions. Roll stiffness is the resistance to body roll, and it usually one of the easiest suspension design parameters to modify. Roll stiffness plays a large role in steering responsiveness and in "understeer" or "oversteer" characteristics. Another function of the suspension is, of course, to allow steering. This is mainly a function of the front suspension, but the rear suspension can also create a steering response of its own. In addition, the rear suspension has an effect on the driveline performance in terms of torque transmission. Springs serve a purpose in keeping the wheels in contact with the road on less than glass-smooth surfaces. As the tires roll over bumps, they tend to bounce. Springs and shocks control this and help to keep the tires on the road most of the time. However, the shocks damp the spring action by reacting against the relatively stable car body. Without very stiff springs, the entire car tends to bounce, and there is no stable platform for the damping action to react against. The result is less time for the tires to be on the ground. High unsprung weight in relation to the body weight aggravate this problem. Unsprung weight is the weight of the parts not supported by the springs. This generally includes half the weight of the spring itself, which is significant only for metal leaf springs, and not for coil springs. When the unsprung weight is high in relation to the car body, the suspension movements tend to move the body more, and there is no longer a stable mass for the dampers to react against. Unsprung weight is not too much of a problem with an independent front suspension. It can be decreased by going to aluminum brake calipers, and is increased by wider wheels and tires. The ultimate solution is a new, light weight aftermarket suspension system. In the rear, the live axle weight is significant, but so are the metal leaf springs which weigh close to 40 pounds for the pair. An independent suspension will reduce unsprung weight the most, but a switch to one of the coil spring conversions will help with a live axle. Also, keep in mind that some American live axles (such as the Ford/Currie 8") actually weigh significantly less than the MGB axle. Body lean should be controlled mainly by anti-roll bars ("sway bars"). An alternative is to install really stiff springs, but, as explained above, this is not a good solution. Ideally, the springs should be relatively soft, with good damping, so the tires remain in contact with the road, and stiff sway bars should be used to control body lean. In theory, a stiff front bar increases understeer because it transfers more load to the outside front tire. In reality, a stiff front bar can often reduce understeer because it also improves the geometry of the tire contact as it decreases lean. A rear sway bar, with a live axle, is more predictable in its effects. The rigid axle means that tire geometry is always relatively good, so a sway bar will increase oversteer (reduce understeer) by decreasing the overall grip in the rear as it transfers load from the inner tire to the outer tire. A consequence of this load transfer is that there is more of a need for a limited slip differential. Therefore, one may wonder why a rear bar is needed at all. The advantage is that body lean cannot be completely controlled only by a front bar, and reduced lean (with a rear bar) can improve the geometry and thus grip of the front end. Best results are obtained when the front and rear grip are equal. Having high grip at the rear does not help cornering speeds if the front loses grip long before. Another advantage is that reduced lean makes the car much more responsive to steering inputs. Finally, with overall reduced body lean, weight transfer to the outer tires will be decreased somewhat, partially cancelling out the detrimental effects on the rear. With many of the more exotic MGB rear suspension systems it is impossible to install the stock MGB rear sway bar. However, with a chrome bumper car, at least, it is relatively easy to fit a sway bar to the bottom of the battery boxes. A front bar from a narrow car such as a Midget or Austin Healey 3000 can work, as well as a cut down MGB front bar. Many British cars come with lever dampers, rather than the more modern tube dampers. Other, even older forms of dampers are friction dampers, and inertia dampers. Friction dampers are like a sort of lever damper, but they have friction disks at their pivot point. They are easy to adjust by tightening or loosening the joint screw and they do work, but not very well. It is generally desirable to have more damping on the rebound rather than on the initial compression stroke. This keeps the suspension compliant with road irregularities, but stops oscillation on the rebound. Friction dampers have the same damping force in both directions. And, of course, they are subject to mechanical wear so do not hold their settings very well. Inertia dampers consist of a weight attached by a spring to a suspension arm. As the suspension moves, the weight opposes the movement through the spring. This system was used mainly on older French cars (as a supplement to friction dampers), and was effective with the soft suspensions these cars had. Careful engineering of the weight and spring was needed so that harmonic vibrations were not set up. Hydraulic dampers work by pumping fluid through small passageways, and spring loaded one-way valves for extra resistance. The two basic configurations are lever and tube. Lever dampers are hydraulic and work the same basic way as typical tube dampers. The main objection is that they can overheat and fade. Fluid capacity is limited, and, even more importantly, the cooling surface area is limited. As the fluid heats up, its viscosity decreases, and so the damping resistance goes down. For mild street use, lever dampers are fine, but for higher performance, fade can become an issue. Tube dampers are universal. They are simple, have good cooling, and can be purchased in all kinds of configurations, including models with adjustments for damping force. Tires are the medium by which the car interacts with the road. The suspension is designed to provide the best functional conditions for the tires, but the ultimate results are limited by the characteristics of the tires. The two basic types of tire construction are bias-ply and radial. Bias-ply tires have cris-crossed layers of reinforcing cord (usually 4 layers). Radial tires are so named because they have radially wrapped cords that run across the tread and though the sidewall to the bead (usually 2 layers), and also a circumferential layer of cords (usually 2 layers of steel wire) under the tread (only). Bias-ply tires have nearly constant stiffness over their whole exterior; the tread's stiffness isn't much different from the sidewalls. Therefore, the tread doesn't have any special tendency to stay flat on the road, and it doesn't track especially well. Radial tires have much more stiffness in the tread area than in the sidewalls, which tends to keep the tread flatter on the road and thus increases tracking stability. At this time, use of bias-ply tires is mainly limited to motorcycles (for obvious reasons) and to vintage show cars. They're also sometimes used for drag racing slicks where the tire sidewalls have huge amounts of torque to transmit. But almost all cars benefit from installation of radial tires. Sometimes it's said that older cars, including classic British sports cars, were designed for bias-ply tires, and will not respond well to radial tires. Not so! Designers in that era lacked the resources to do this. As radial tires began to come into general use in the 1960's, it would have been counter-productive anyway because radial tires were better in all ways. There may be certain suspension settings that are different with radial tires (they favor more caster angle and less toe-in) but the differences are minor. Be aware, however, that many old wheel rims that were designed for tube-type bias-ply tires don't grip a radial tire bead properly and can be dangerous with radial tires. Of course, most V8 cars will have major suspension modifications anyway, which is what this article is about, so the original design parameters of the car are irrelevant. Aside from the type of construction, other major parameters are tread compound and tread design. Summer tires are constructed with soft rubber that works very well on hot road surfaces. On colder road surfaces, summer tires give significantly reduced traction. Winter tires have a high silica tread compound which is soft at cold temperatures, and that gets even softer at summer temperatures. These excessively soft tires never have very good grip on dry roads, and will wear very quickly if used for performance driving. All season tires are made from rubber which is somewhat harder than either summer or winter tires, and they also contain silica. The silica acts like sandpaper and increases traction on cold surfaces and on ice, but it reduces grip on hot, dry pavement compared to the pure rubber of summer tires. These tires do not give either optimum summer or winter performance, but can be a reasonable compromise. If the car will not be driven in the winter, it makes sense to get summer tires. Racing tires are like summer tires, but even better. However, they wear very rapidly, and some are not even street legal. Racing tires also tend to be noisy and harsh, which makes them less well suited for use with "real" road conditions, but they can make a dramatic improvement in track day use or in autocross times. Tread design affects ride, handling, noise, and traction on wet roads. Street tires are designed with relatively deep tread patterns and also typically with wide grooves to shed water. However, the deep tread reduces tire response because the tread blocks tend to squirm independently of the tire body. Dry course racing tires have much shallower treads, or no tread at all (e.g. racing "slicks"). This gives the maximum rubber contact and tire stability, but they are very dangerous in the rain because water builds up under the tire causing the car to hydroplane. Most of the noise generated by tires is from the tread design. It arises as air is compressed and released from the tread grooves, and also from vibrations in the tire itself. If you want a quiet tire, the best bet is to look at the ratings on Tire Rack (or a similar website). There is no reliable way to predict noise from just looking at a tire, though one favorable design feature is a continuous center rib. Tire width should be as wide as possible, assuming a reasonably functional suspension geometry. The classical friction equation is that frictional force equals a coefficient of friction times the force per unit area. Force is the weight on the tire, and area is the tire contact patch. In general, as the tire gets wider, the contact patch gets bigger, and the force per unit area (pounds/square inch) goes down. But the increased area means the frictional force remains about the same. However, this simple equation does not apply to tires! A wider tire and a large contact patch always generates more frictional force, and maximum performance is always achieved with as wide a tire as possible (assuming that the suspension geometry can keep the tire in reasonable contact with the road). Remember that the goal is to have as much tread surface as possible on the road. This is a function of the suspension as well as the tires. The more vertical the tires are, the flatter the tread will be on the road. Compared to skinnier tires, wider tires lose effectiveness more rapidly as the tires are tilted from vertical because the loading across the wider tread varies more as tilt increases. Radial tires are one solution, because the relatively stiff tread and relatively flexible sidewalls help to isolate the tread from the tire tilt. The ultimate solution however is to reduce body lean as much as possible, and optimize the suspension geometry to minimize the effects of what body lean is left. This condition, which is most likely to occur at the rear, should be avoided for several reasons, including the possibility of a catastrophic accident. One consequence that comes to mind is that heavy tire/body contact can wear the tire side wall and lead to a blowout, but that is one of the least likely effects. Much more common is light contact between the tire sidewall and the inside of the outer fender, especially as the suspension is compressed. While tire wear will be minimal, it can lead unstable cornering response as the tire friction raises (or lowers) the body until the forces overcome the tire friction, leading to sudden settling, followed by a new round of tire induced motion. In extreme cases this can lead to loss of control. But by far the most serious problem is if the tire tread ever contacts the inside top of the wheel well. The resulting friction will tend to drive the wheel backwards with great force and great consequences. 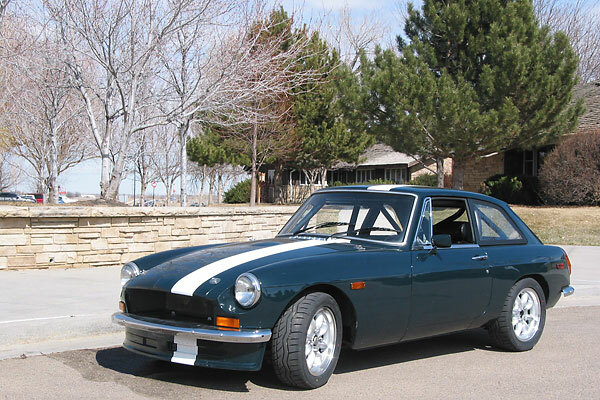 The prototype MGB with swing axle rear suspension encountered this on a test drive, and the result was that as the wheel was forced backwards, its longitudinal arm broke, the tire went under the car, and the car overturned. Luckily the driver escaped without serious injury. Therefore, check carefully when fitting significantly larger tires or a much lowered suspension. Make sure the bump stops will be adequate to prevent tread contact. An easy way to check for tire contact is to jack up one corner of the car, which will usually fully compress the diagonally opposite suspension unit. Even if clearance appears to be adequate by this test, keep in mind that this is only a static test, and the suspension can move under load. In terms of side clearance, for a stock leaf spring axle, maybe about 1/4 inch of extra side clearance is needed. With a Panhard rod with nylon bushings or heim joints, maybe only 1/16 inch of clearance is needed. In terms of tire clearance at the top of the wheel well, bump stops can compress a fair amount under impact loads, so probably 3/4 to 1 inch of clearance is needed. A rigid chassis structure is highly desirable. Even if the suspension geometry is optimized, body flex can upset the geometry and lead to less than optimum "real world" results. Generally, flex shows up as sloppiness and poor transitional response such as when entering a corner - a "vagueness" in the driver-feedback loop. This flexing makes a car less predicatably responsive to suspension tuning: it becomes more difficult to evaluate the efficacy of changes to the sway bars or to tire pressure. It's interesting to compare the Porsche Boxster and Cayman models. Both cars share the same basic platform and suspension, but the Cayman definitely handles better. The closed Cayman body has about 50 percent more torsional rigidity than the open Boxster so the Porsche engineers decided that the Cayman body could take both increased spring rates and stiffer sway bars compared to the Boxster. 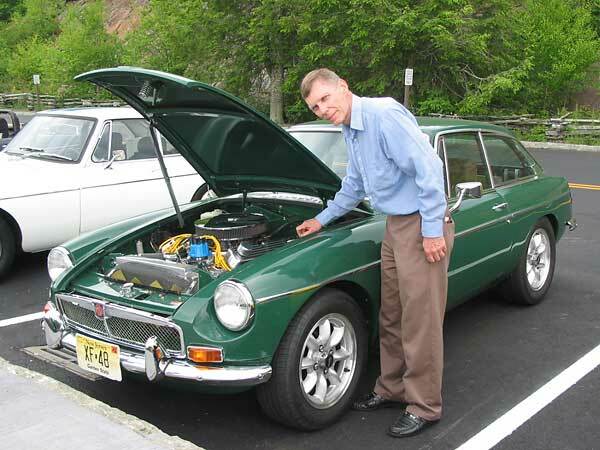 Generally speaking, unit body cars (such as MGB) tend to be more rigid than cars of comparable weight with body-on-frame construction (such as TR6); closed cars (GT's) tend to be more rigid than convertibles. Although the MGB featured a notably stiff chassis for its era, it comes nowhere close to the strength of many modern cars. Furthermore corrosion, fatigue, and/or inadequately repaired collision damage can substantally (and sometimes unpredictably) reduce the rigidity of any automotive chassis over its service life. Restraint is called for when performing suspension upgrades. If you notice door gaps changing during cornering or "scuttle shake" on bumpy pavement, a point of diminishing returns has been reached. It's time to soften up the suspension or add chassis reinforcements. Some chassis reinforcements appear so modest, one might incorrectly discount their efficacy. The MG Rover "RV8" model demonstrated to us that there were significant gains to be had just by strengthening the forward leaf spring mounts of the MGB bodyshell. "Seam welds" are a well proven technique for strengthening the chassis by adding new welds redundant to original-equipment spot welds. Then there are more elaborate solutions. Racing-style roll cages can be much more than just safety equipment! Tied strategically into the body of a race car, roll cages in many cases double chassis rigidity. Even less elaborate roll cage installations can add enough rigidity to dramatically improve the handling characteristics of a street-driven sports car, especially if the suspension is tuned to leverage the added potential. There can be tradeoffs though, such as increased noise and vibration in the driver environment or inconvenient egress. The simplest rear suspension for road cars consists of a solid rear axle suspended on leaf springs. The springs provide all the axle location functions and also provide springing to accommodate bumps. For high performance applications, this leaves much to be desired. On traditional rear-wheel-drive sports cars, the rear axle location is affected by both braking and accelerating forces. As most MGB V8 owners have discovered, with the torque of a V8, the rear springs wind up during acceleration which can lead to "tramp". The ring gear is connected to the ground through the wheels and tires. As the pinion puts force on the ring gear, the pinion tends to climb up the ring gear, which turns the whole axle housing. This twists the springs to the point where the spring torque exceeds the driving torque, at which point the axle snaps back, causing a judder. There are many potential ways to attack this, including: (a) reinforcing the front of the spring, (b) adding a parallel radius bar below the spring, and (c) adding a "pinion snubber" (which is a rubber stop above the pinion housing that restricts upward movement). The driving force of the axle is transmitted through the two front spring mounts. On MGB's (especially later-model rubber bumper MGB's, which have a different attachment bracket and ride height) this can induce chassis flex. One way to cure this is to weld in reinforcing bars between the spring mounts and the center cross member. On hard cornering, leaf springs allow some side-to-side movement of the axle. This reduces steering response and precision, and can lead to the tires rubbing on the inner fender lips. To a limited extent, side-to-side axle movement can be addressed by selecting stiffer spring bushings and/or more robust spring shackles. For more positive control, a popular fix is to install a Panhard rod (a.k.a. "Panhard bar"). A Panhard rod is a kind of torque rod that's installed horizontally, parallel to the axle, with one end secured to the axle and the other end secured to the body. A Panhard rod can be a simple and economical solution, but it's not a perfect one. To be effective, the Panhard rod and its mountings must be sufficiently rigid. The Panhard rod should be installed level, and usually it should be mounted as low as feasible. The rod itself should be as long as feasible. Suspension links are often used to restrict movement in one axis. A Panhard rod is a great example: its purpose is to restrict side-to-side motion of the car's axle relative to its body when the car is turning. However, when the car goes over a bump the Panhard rod pivots out-of-parallel with the axis and body. 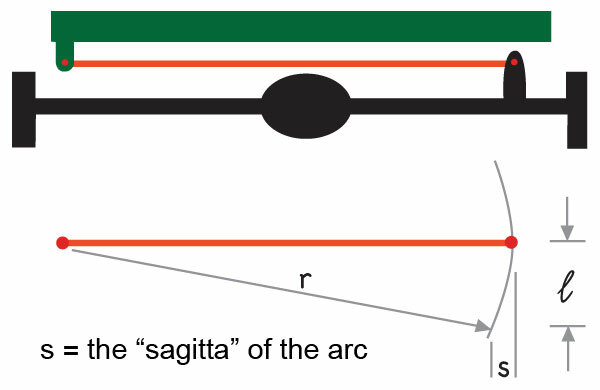 As one end of the bar travels in an arc, it forces unwanted side-to-side movement. When subjected to a three-inch tall bump in the road, a 12" long Panhard rod would subject the car to a horizontal body movement of 0.381", which is enough that most drivers would perceive it as a noticeable "shimmy" or, in other words, as a "bump steer" effect initiated from the rear of the car. By comparison, a 36" long Panhard rod in the same situation would subject the car to a horizontal body movement of 0.125". That's unperceptible to most drivers. There's plenty of room to package a 36" Panhard rod on any typical British sports car. In terms of geometry, longer is simply better. Incidentally, Panhard rods aren't the only place this rule of thumb applies. It's also true for other types of suspension links. Typically, a well designed Panhard rod provides a big improvement over just leaf springs. Another step up is a Watts linkage, which is like a Panhard bar, but with a center linkage that keeps the axle centered in the chassis at all times. As far as I know, there is no readily available Watts linkage kit for British cars, but custom installations have been made. Note: Panhard rod or Watts linkage installations only help cornering, and not torque transmission. It should also be noted that a Panhard rod can significantly alter the roll center height of the rear suspension. On a leaf sprung live axle without a Panhard rod, roll center height is very nearly at axle centerline. (Technically, roll center height is found by drawing a line from the front spring eye to the lower shackle bushing, and observing where the line crosses the vertical plane of the axle centerline.) When you add a horizontal Panhard rod to the leaf spring rear suspension, the roll center height is relocated to very nearly the height of the Panhard rod. There is also the multi-link rear suspension. It consists of at least two parallel trailing arms for front to rear location that are attached to the bottom of the axle; and two angled upper arms (or one triangle arm) that provide lateral location and also torque control. These systems are always used along with coil springs. There is now a kit for MGBs (vendor). In a much more difficult conversion, several people have installed new rear frame sections on TR6s to get the 4 link suspension. Frame sections are made for street rod fabricators and they can be adapted. Multi-link suspensions can allow rear axle steering under high cornering forces as the suspension bushings deflect. Obviously the more rigid the bushings (up to the extreme case of Heim joints) the less deflection. Rear steering reduces responsiveness and precision, but the associated softer bushings make the car much more civilized in terms of road noise and vibration. 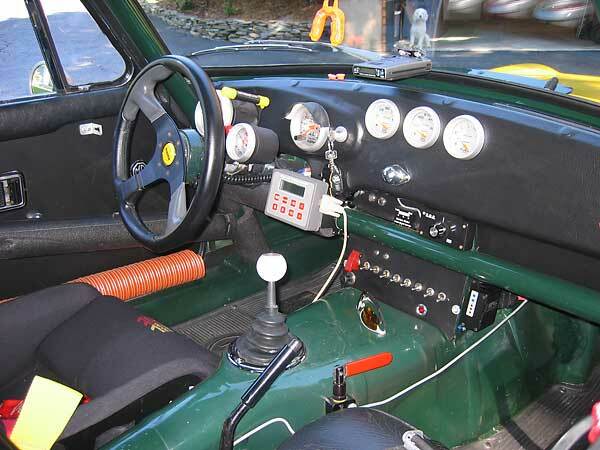 There are independent rear suspension kits available for the MGB and others can be adapted such as the Jaguar unit. The geometrical consequences of these are similar to double A-arm front suspensions, covered in the next section. Semi trailing arm suspensions like that found on TR6s will not be covered, nor will McPherson strut suspensions as these generally aren't found on vintage British sports cars. As was mentioned earlier, independent suspensions tilt with the body, and so need "camber gain" as they are compressed to keep the wheels upright in a corner. The basic mechanism for this is by using long lower arms and short upper arms. The lower arms trace a longer arc when they move than the upper arms. This results in less lateral deflection at the bottom of the suspension than at the top, leading to an increase in negative camber on the outside wheel in a turn. For best results, the lower arms should be set at a static ride height so they point down towards the wheel, or are, at worst, level; while the upper arms should point up towards the wheel. Upon deflection, the lower arms will move the bottom of the wheel out as they go from pointing down to level, then start to move the wheel in as they move up from level. The upper arms will always pull the upper part of the suspension inward as they pivot upward, and the movement will be to a greater extent than the lower arms, thus providing camber gain. The front roll center is located on a point on or above lines extrapolated inward along the lower control arms. This means that as long as the arms are level, the roll center is no lower than the inner pivot points of the arms. Once the suspension is lowered so the arms point upward towards the front wheels, then the roll center can go "underground". While there will still be some camber gain in this situation, this low roll center is why the suspension should never be lowered so that the arms slope upward. With the rubber bumper cross members used on many MGB V8 conversions, not lowering the suspension can result in an undesirably high ride height. The solutions to this are: (a) live with it (fine for street driving), (b) stiffer sway bars to reduce body roll (see below), (c) custom drop spindles, (d) using a chrome bumper suspension by lowering the steering rack, and (e) custom front suspensions (vendor). A mismatch between front and rear roll centers (almost always with a lower front center) tends to give less predictable handling. It can cause, for example, extreme understeer followed by sudden oversteer. Matched roll centers result in a more linear and predictable response. Longer lower A-arms can be used to increase static camber, and so lead to less of a need for camber gain in cornering. However, in a turn the inside wheel will have an even more unfavorable geometry; and in straight line travel, the tires will not be as evenly loaded across the tread, especially with wide tires. This can decrease braking efficiency. There are many factors in play: toe in/out, Ackerman effect, scrub radius, and caster angle. "Toe-in" is when the wheels point towards each other and "toe-out" is when the wheels point away from each other. The ideal situation for a rear wheel drive street car is slight toe-in. As the car moves forward, drag from the tires tends to push the alignment toward a toe-out condition. Slight toe-in stabilizes the steering by slightly "preloading" the tires inward. If a toe-out condition exists at speed, the steering becomes noticeably unstable. Sometimes toe-out is set on a road race car to deliberately create instability in order to improve initial steering response, but this characteristic isn't pleasant in daily driving. Logically, toe-in (or toe-out) should probably be measured and communicated as an angle, but to accurately calculate the included angle, as measured with typical shop equipment (such as improvised trammel bars or strings) would require trigonometry. So, the standard convention is to dumb toe-in measurements down to fractions of an inch as measured between tires at the three and nine o'clock positions at their circumference. (Obviously, toe-in measurements are thus affected by tire diameter.) The desired amount of toe-in is also largely a matter of driver preference. Many MGB owners like as little as 1/16" of toe-in, and few people recommend more than 3/16" of toe-in. Theoretically, toe-in should be reduced as tires get wider. Wide tires perform best if they are as parallel as possible since "scrub" due to misalignment is amplified across a wide tread. With narrow tires, it is ok to err on the side of excessive toe in, but more precision is beneficial as tires get better. The two front wheels follow different arcs in a turn, with the inner wheel taking a tighter turning radius. The compensation for this is known as the "Ackerman" effect. It is mainly important in low speed maneuvers at extreme steering lock such as parking, and has a minor effect on normal driving. Still, it should be understood. With a rack and pinion, and with the rack forward of the front axle, Ackerman geometry is achieved by having the steering arms make an angle with the tie rods that is slightly less than 90 degrees. As the wheels are steered, the outer arm moves less as its angle with the tie rod goes through 90 degrees and continues to widen. 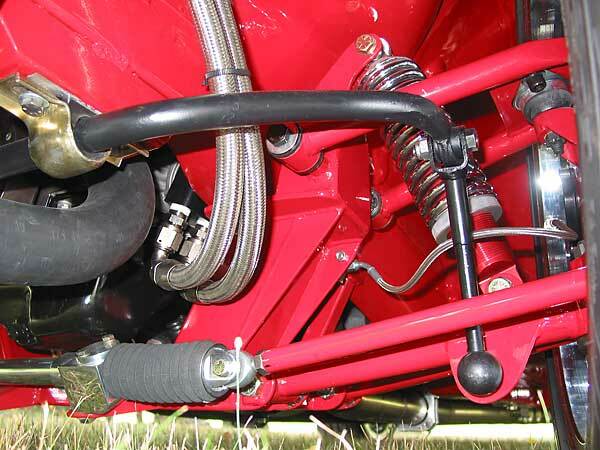 The inner steering arm continues to make a tighter and tighter angle with the tie rod and so moves a greater distance, making a tighter turning radius. Normally, this geometry is not adjustable; but rubber bumper MGs have the rack moved slightly forward, which makes the tie rod to steering arm angle closer to 90 degrees at the straight ahead position, and so is less favorable. Moving a chrome bumper rack forward to clear an engine can also lead to a reduction in the Ackerman effect. In cars with the steering rack behind the front axle, the tie rods need to make an angle with the steering arms that is greater than 90 degrees in order to achieve the proper Ackerman geometry. This is the distance between the center of the tire tread and the point where the kingpin axis intersects the ground. Essentially all rear wheel drive cars are designed to incorporate a positive scrub radius, meaning that the tire contact center is outside the kingpin pivot point. A large scrub radius gives lighter steering because the tires can roll in an arc as the steering wheel is turned. If the scrub radius is zero, then the tire has to be twisted on the ground, and the steering effort is highest. However, too large of a scrub radius makes the steering very sensitive to road surface irregularities. As the tire hits a bump, it will tend to turn the steering wheel to the side. Technically, this is not bump steer, although it is associated with bumps and steering. Having a zero scrub radius also results in unstable steering as the drag from the tires can switch back and forth since there is no "preload" condition. The ideal situation is to have a slight positive scrub radius such that the normal drag from both front tires is slightly loading the steering, and yet not so much that road bumps cause too much of an additional drag. The way to control scrub radius is by the wheel offset. Wheel offset is a measure of the wheel hub mounting surface in relation to the wheel center (width). A positive offset means the mounting surface is offset towards the outside of the wheel, and a negative offset puts the mounting surface towards the inside of the wheel. As designed, an MG has about a 24 mm positive offset. A smaller positive wheel offset, or a negative offset (as is sometimes used with wheels to fill the fender wells on MGB Sebring conversions) can lead to a very excessive scrub radius. If a wider front track is desired, then it is better to get longer A-arms rather than decrease the wheel offset. Longer A rams are available for several front suspensions such as Fast Cars and Hoyle. Even with a stock width MGB, the standard scrub radius can be excessive. Wide wheels and tires load the steering more than the skinny original tires, so bump sensitivity can be increased. I found that by going to wheels with a larger, 35 mm offset (and 5/8 inch longer A-arms) steering stability was significantly improved. Positive caster means the king pin axis tilts rearward (as on a bicycle). Negative caster means the axis tilts forward (as on a shopping cart). In an automobile suspension design, caster serves two purposes: it increases steering stability and it helps camber gain upon cornering. Positive caster is associated with stability. Note that a bicycle tends to track straight if left on its own, while the casters on a shopping cart tend to oscillate. This effect is also obvious when a car is driven at high speed in reverse. The stability (self centering) effect of caster is associated with the car being slightly raised as the wheels pivot from the straight ahead position. Caster is another area where there is a question of driver preference. 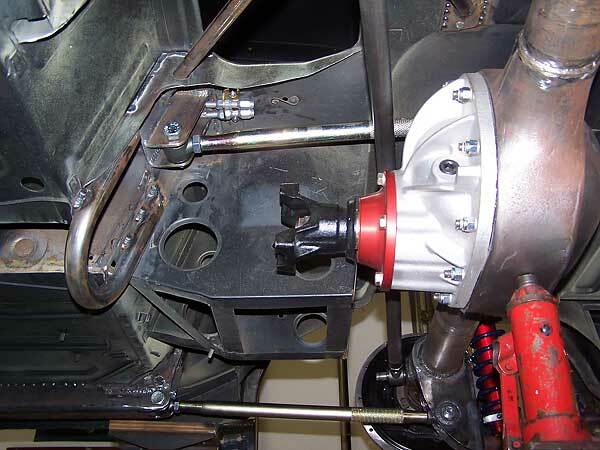 In the case of the MGB, the suspension was originally designed with about seven degrees of caster, but caster reduction kits are offered to reduce caster and thereby reduce steering effort. These kits make more sense for cars with radial tires (instead of the bias ply tires) and smaller diameter steering wheels. Another effect of positive caster is that, on a turn, it makes the top of the outer wheel tilt in and the top of the inner wheel tilt out, thus countering body lean and complimenting camber gain to some extent. This is a very desirable effect, and all modern cars with power steering have generally much greater caster angles than older cars with manual steering. Disclaimer: This page was researched and written by Larry Shimp. Views expressed are those of the author, and are provided without warrantee or guarantee. Apply at your own risk. The design and condition of the suspension has a significant influence on safety. Only people with appropriate qualifications should ever carry out suspension work. It is strongly advised to consult a professional before starting any suspension project, and at the very least, to have a professional mechanic inspect any work that has been carried out. Photos by Curtis Jacobson, Dan Masters, and Lorenz Hassenstein respectively, for British V8 Magazine. Sagitta illustration by Lisa Kerans for British V8 Magazine. All rights reserved.